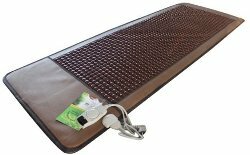 The HealthyLine™ InfraMat™ LargeMat-T is much more than a run-of-the-mill heating pad. It combines far-infrared heat that penetrates the body’s tissues, bones, and organs up to ten times deeper than an ordinary heating pad with the natural healing properties of high-quality tourmaline stones, which have long been renowned for their incredible benefits. The rare tourmaline stones used in the InfraMat™ are composed of a complex group of silicate minerals. Passing heat through these tourmaline stones transforms it into far-infrared heat, and tourmaline is considered one of the most effective stones at soaking up natural heat due to its unique composition of many various silicate elements. When crushed and specially treated for use in HealthyLine products, it has particularly powerful healing capabilities.